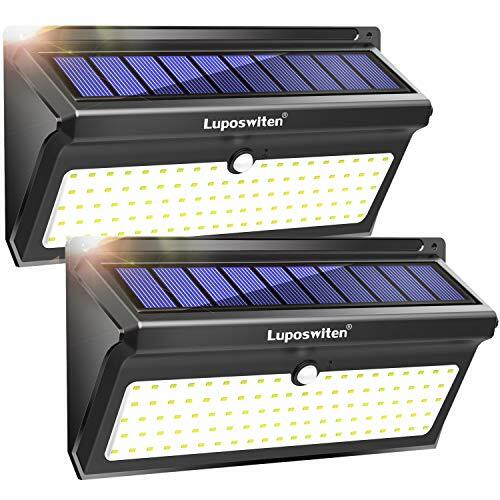 【Super Higher Brightness】: Solar IP65 waterproof lights outdoor include 100 powerful LEDs and can produce 2000 lumens, which means higher brightness and larger lighting range. A good choice for both pathway and spotlight lighting within your yard. 【Longer Working Time】: With a 2600mAH Li-ion battery, after charged in the daytime, it will work for over 12 hrs. And with heatproof and water-resistant design, its lifespan amounts to 5,000 hours, much longer than any ordinary lamp. 【Extremely Sensitive Sensor】: The LED motion sensor light will be activated once it detects any motion , and will automatically turn off after lighting on around 30 seconds. The motion sensor can detect movement up to 26 feet at a 125 degree angle. NO DIM MODE. Only Two Modes: ON/OFF. 【Quickly Install】: This wireless solar motion light can be mounted in no time and is ready to work right out-of-the-box. The solar light has a mounting hole for a screw or can be attached to any surface with the help of adhesive tape. 【Warranty Policy】: This wall lamp（2 pack）made of high-strength ABS, its waterproof grade reaches IP65. We promise a 30-Day Money Back Guarantee and 90-Day Limited Product Warranty. If you have any questions about this product by Luposwiten, contact us by completing and submitting the form below. If you are looking for a specif part number, please include it with your message.